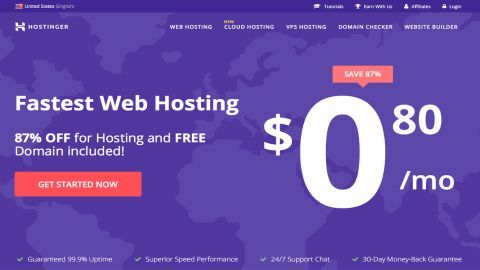 Offering good value hosting with some interesting features, Hostinger is worth a look for novice and intermediate users. Founded back in 2004 as 'Hosting media', Lithuania-based Hostinger has expanded to become a popular website hosting provider with more than 29 million customers, and offices around the world. The company website doesn't try to put a gloss on its service by talking about 'value' products or a 'budget' range. It gets straight to the point: Hostinger is all about 'cheap web hosting'. The range starts with a $5.99 (£4.60) a month (over two years) 'Single Web Hosting' plan aimed at home users. Hostinger is currently offering discounts on all tiers meaning a two-year subscription works out at $2 (£1.53) per month. This plan limits you to a single website and subdomain, 10GB of drive space, 100GB bandwidth a month and just a single email address. An Easy Website Builder makes it simple to get started, though, and there are one-click installers for WordPress and other popular apps. The package is probably enough to run a simple personal or family site. If you've bigger hosting ambitions, the 'Premium Web Hosting' plan might be a better deal. It's currently available from as little as $3.49 (£2.67) per month but lifts all the restrictions, giving you unlimited drive space, bandwidth, subdomains, databases, FTP users and email accounts, and supports as many websites as you need. All Premium plans include an 'Optimised Speed' system for up to three WordPress sites, SSH access is available, and you get a free domain name with the annual plan. The 'Business Web Hosting' plan, which is available from $8.96 (£6.85) per month, throws in a free SSL certificate, along with daily backups and more processing power. All subscribers receive 24/7 online support, no matter what plan they have chosen. More demanding users could try one of Hostinger's VPS plans. These start at $4.99 (£3.81) a month for a reasonable specification: 1GB RAM, 2GB burst RAM, 20GB hard drive, 1000GB bandwidth. The plans aren't very customizable, but with six to choose from, there's a good chance you'll find something that works for you. All the plans are covered by a 30-day money-back guarantee. This has the usual restrictions you'll get with hosting – you won't be refunded for registering a domain name, for instance – but we didn't notice any other sneaky clauses which might catch you out. While many hosts are annoyingly vague about the low-level details of their packages, Hostinger spells out almost everything in a lengthy comparison table. Delving into this, we only spotted one restriction we hadn't noticed before, but it was an important one: the limited 'Single Web Hosting' plan doesn't support POP3, IMAP or SMTP access to its email account. It's strictly webmail-only. Choose a plan, click Buy and you might get your first surprise – the quoted prices assume you're paying for two years upfront. If you'd prefer the one-year option, the Premium Web Hosting plan will cost you an extra £1 ($1.25) a month. Still, on the positive side, you can purchase up to four years of Premium web hosting for only £2.95 ($3.60) a month, or £141.60 ($177) in total. That's good value for a package with unlimited websites, web space and bandwidth. The website page didn't drown us with extra offers, and upselling efforts were kept to a minimum. The only significant new purchase option was a shared SSL certificate for a one-off £6.59 ($8.20). Pay the fee just once and you're covered for as long as you stay with Hostinger. We chose a plan and were prompted to create an account. Hostinger has options to sign up with Facebook and Google, unusually, which is convenient but not so secure (anyone with access to your credentials or a device logged in to Facebook or Google could access your hosting account, too). It's easy to create an account manually, though, and Hostinger only needs a few details: name, email address and password. There are plenty of payment options available, including PayPal, credit card and Bitcoin. We chose PayPal and handed over our virtual cash in the usual way. A website link took us to a simple startup wizard and a welcome email quickly arrived with more details. Hostinger's setup wizard opened by asking us whether we wanted to register a new domain, transfer a domain from another company, or use an existing domain but leave it with the current registrar. You've also able to choose where your site will be hosted, conveniently: North America or the UK. We chose the 'existing domain' option and were given Hostinger's four name servers, and told to update our domain DNS settings. Some web hosts offer tutorials showing how to do this with popular registrars, but Hostinger doesn't make quite as much effort, stating: "If you need more help with this, you can contact the domain registrar for assistance." The final 'Start website' step was more useful, with five options to help us create our website. 'Install WordPress' took us to a straightforward WordPress installer. All the default settings were sensibly assigned, and after choosing an admin password we could set the system up with a click. 'Auto Installer' uses the same automated approach to install many other popular apps, including Joomla, PrestaShop, OpenCart, phpBB and Drupal. We still prefer Softaculous, the installer often provided by other hosts, but this one is perfectly adequate and will get your chosen apps installed at speed. Zyro Builder is Hostinger's website builder. This covers all the basics, with 195 responsive templates, easy drag-and-drop customizations, and options to embed videos, maps, social media widgets and simple e-commerce features. It's not for advanced users – there's no blogging platform, for instance – and design is more about mild tweaking of a template than building something new from scratch. That's not going to be a problem for most people, though, and if you're in any doubt, a free testing page allows you to try before you buy, no registration required. File Manager opens a browser-based file manager where you can upload your site. This will probably only work with small and self-contained sites, but it's available if you need it. Access Manager is an unusual extra tool which allows you to give others access to your Hostinger account, enabling them to work on creating or managing the site with you. You could do something similar by sharing your credentials with others, but this is much safer. Everyone gets their own login, and the people you invite don't get full access to your account. They're able to create or edit a website page, for instance, but by default they can't buy a new product with your stored payment details, or change account details such as your registered email address. Experienced users might skip past all of this and head straight for Hostinger's well-designed cPanel-like console, where there are all the regular tools for managing domains, subdomains, databases, SSH access, emails, FTP accounts and more. This is a full-strength control panel, and it might be a little intimidating for hosting first-timers, but start to explore and it quickly begins to make sense. Even novice users will be finding their way around the key features within an hour or two. Everyone needs a helping hand sometimes, even experts, so it's important for web hosts to have a good support system. Clicking 'Help' on Hostinger's Control Panel opens the service knowledgebase. This groups articles by common topics (Getting Started, Website, cPanel, Email, Domains, Billing), lists popular articles and has a search box to help you find whatever you need. Some of the articles are extremely basic. When we saw the title 'How can I create an e-commerce website?' we were expecting a detailed guide, but what we got was the single line: "You can use our Zyro Website builder which can be found in your Control Panel". The system works better with small and more specific issues. Typing 'permissions' gave us advice on setting file and folder permissions, as well as referring to specific error messages ('403 forbidden'). Entering 'change PHP version' pointed us straight to the correct cPanel module. The content of these articles was basic, but enough to point readers in the right direction. Hostinger has a big tutorials section with far more detailed articles: 'How to check your website's error log', 'Speed up WordPress in 9 easy steps', 'How to back up your emails', and more. These seem well-written and genuinely helpful, but they're not directly searchable from the knowledgebase, and the tutorial's own search system is poor. If you can't find what you need, 24/7 support is available (every day of the year) via live chat and a ticket-based system (not telephone). We opened a ticket, asking whether it was possible to import an existing WordPress site. It took a relatively sluggish seven hours to get a response, but the reply was a good one, pointing us directly to a tutorial that could help, and making it clear that we should get back in touch if we needed more help. We rounded off our tests by running Bitcatcha and other tests on our Hostinger server. The IP location showed this was allocated in the UK, as we had requested, so connections from London saw the best performance. Speeds were average from all locations, but that's what we would expect for a budget hosting service, and overall Hostinger’s performance was very acceptable. Hostinger offers plenty of features and powerful cPanel-based site management for a very fair price. Worth a look for intermediate users who need a little more than the hosting basics.